___Since 2011, Joyce Urbanus and Dax Roll propose distinguishable interior design and styling solutions. For our label they designed the custom Bespoke Transcience Mirrors i.c.w. Lex Pott & David Derksen: handmade unique pieces revealing different states of oxidation through an accelerated process where every pattern looks slightly different on each piece. Joyce Urbanus is a fashion, interior and media designer by academic formation: she studied at the Artemis Styling Academy in Amsterdam. Dax Roll did his studies in Marketing & Communication. Their work ranges from food concept to interior design and styling for retails, bars, restaurants, hotels, offices and private residences. Surrounded by a solid team of assistants, Joyce and Dax keep their research and work growing in number, diversity and size, while relentlessly exploring new territories. 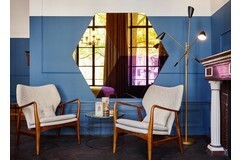 The young duo won several international awards since the very start of their experimentation in the interior design and styling areas: the Amsterdam based salad bar concept SLA and the design for the interior of the Hoxton Hotel are just a few examples of their outstanding talent.